In the standards of Singapore, every hotel room is either expensive or the space is limited. This has been my challenge in this city. The ones who offer both always has a catch, it is either at an offbeat location or the quality of service is a letdown. Fortunately, there was one who hit all my criteria right away. Location, service, space and definitely the cost. It is a given that the first three items in my criteria comprises the fourth - the cost. However, there will always be hotel brands who would step up the game and offer a deal you can't miss. It's finding a needle in a haystack, it might be daunting to find but you know it is there. 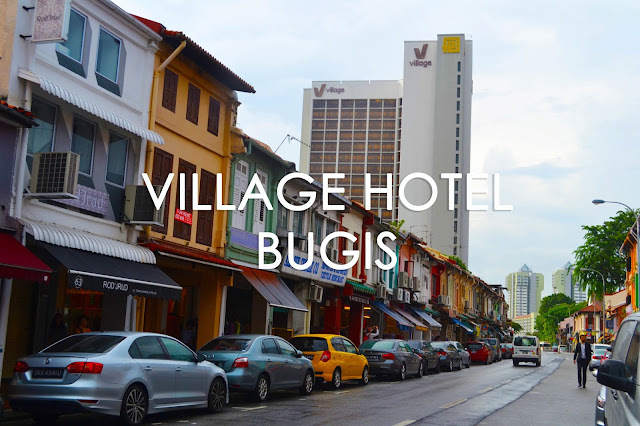 The Village Hotel Bugis was an inevitable choice after storming the web for options. I closely read through the details of the amenities and checked the price tag that comes along with it, it didn't take long for me to be convinced. It is a four star hotel that sits right across key areas in Singapore - Bugis and Haji Lane. Both were in my to-go list and the Village Hotel was right in the middle of the two. We climbed up to the second floor where the hotel's main lobby is located. The hotel manager Zul checked us in very swiftly and was gracious enough to offer options of upgrading which we delightfully accepted for a minimal cost. It was the right move considering the room was newly renovated and there were plenty of options for a buffet breakfast - Indian, Arab and Chinese/Western. It was such delight to enter the room. It was bright and inviting, the linens and the beds were perfectly tucked and the cleanliness was absolutely spot on. The bathroom was everything I hope it would be, squeaky neat and water is drained well on the floor. I also loved how lighting was accorded carefully in the room and a seemingly lazy boy inside is just a cherry on top. The view outside the window was also very stunning that I'd like to sleep with the curtains wide open so I can wake up to the sunshine and the amazing same view. We spent most of my days wandering Singapore and I regret not having a chance to swim which I always enjoy doing. The view from my room is always so inviting and sometimes I would see a number of people enjoying a dip or celebrating a wedding on the poolside which by the way, also houses The Landmark, a bar and restaurant. The Village Hotel is a 5-minute walk from the Bugis MRT station and an 8-minute walk to the Bugis Junction. Book directly on their website at http://www.stayfareast.com/en/hotels/village-hotel-bugis.aspx to earn free vouchers of a city hop-on hop-off bus tour. I am impressed with the rooms and the views. This hotel is on my list when I visit SG.